Though I’ve known about green smoothies for a long time now, my mind is still blown by that fact that I can rack up 4 servings of fruit and veg before the clock ever strikes 8 (or in our house, 11 – don’t judge). 1. 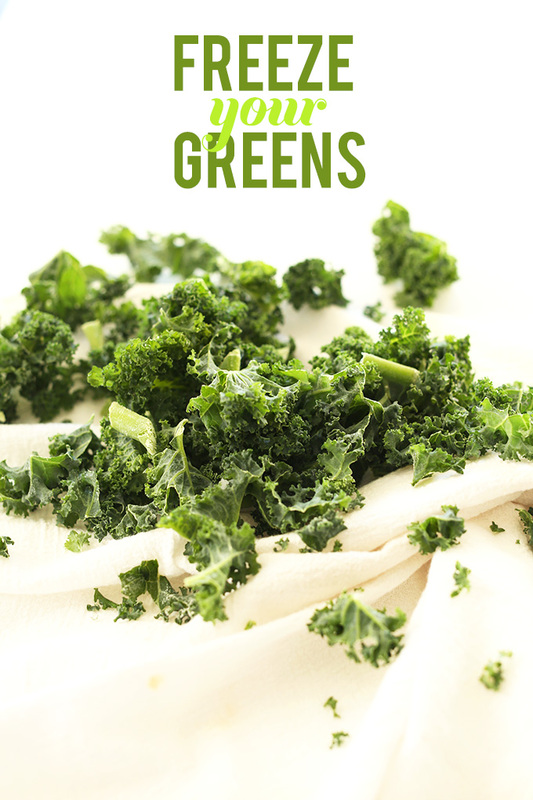 You can throw your greens in the freezer so you always have dark leafy, nutrient-packed greens on hand. Look at that! So fancy! And it doesn’t affect the flavor or texture of your smoothie one bit. 2. 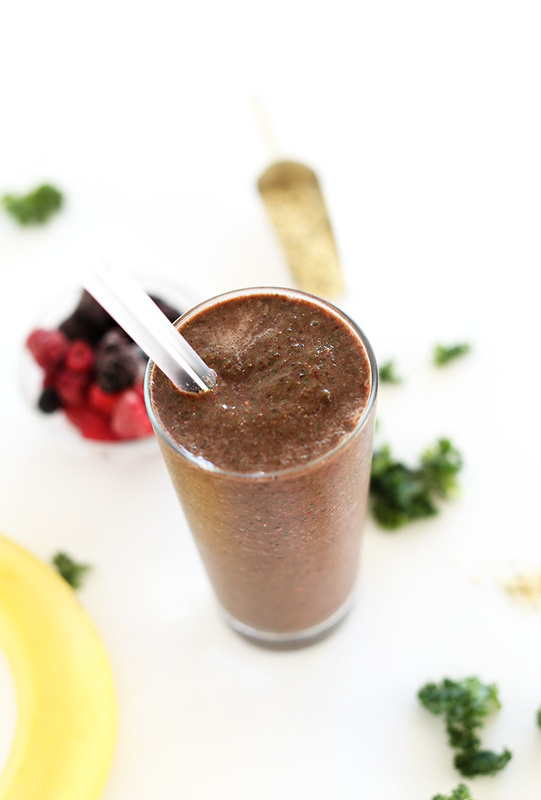 You can craft a smoothie that completely hides the taste and texture of kale. And not a little kale, like handfuls. Let’s do this! This smoothie is the same but different than my 5 Ingredient Detox Smoothie. They both contain frozen bananas, frozen berries and fruit juice. But this one hides kale like a boss and is packed with hemp seeds. Well, Sheila and Rhonda, let me tell you. It matters because hemp seeds contain loads of fiber, protein, vitamins, minerals and all 20 of the essential amino acids, including the 9 essential ones. And all of that supports just about every part of your body function. You need hemp seeds in your life, period. Smoothies are easy. I don’t need to tell you that! Just add everything to a blender and whirl. Yipee! 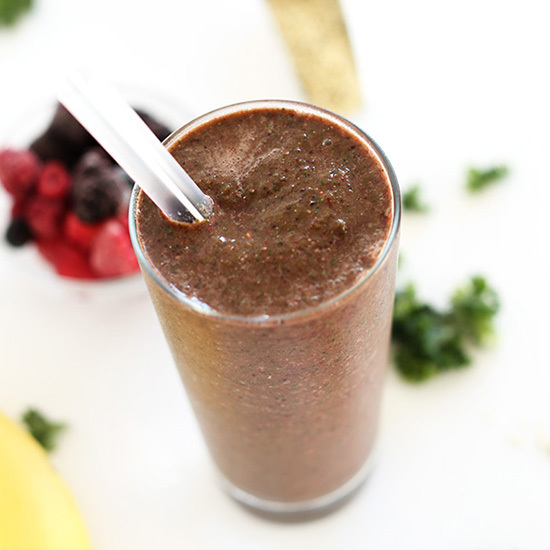 A nutrient-packed berry smoothie that’s sweet and creamy and hides the taste and texture of kale! The perfect healthy breakfast, post-workout meal, or afternoon snack. 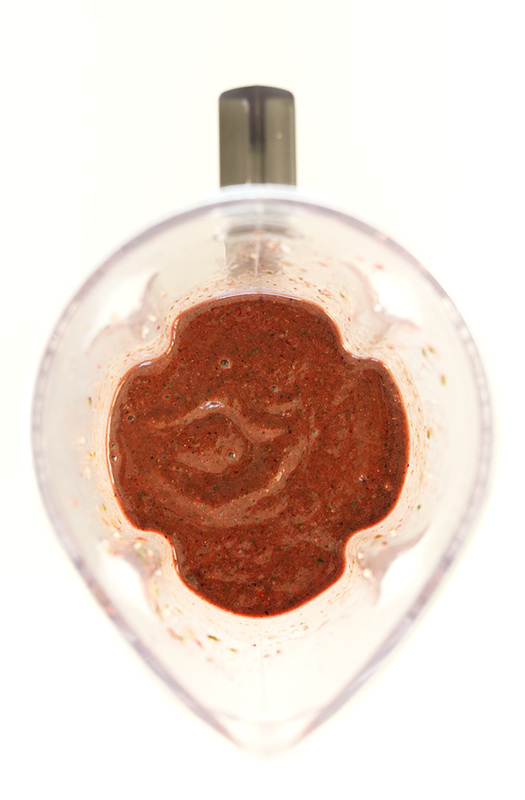 Add all ingredients to a blender and blend until smooth, adding more water as needed. Taste and adjust flavors as needed. Add more banana or some agave for added sweetness. Serve immediately – enough for 2. *Pomegranate juice really makes this recipe and seems to hide the kale best. I’ve tried it with orange and cherry and they didn’t do the job quite as well! Use substitute as you see fit. *Adding a bit of almond milk ups the creaminess. *1 Tbsp of almond butter would add even more staying power. Should I Blanche the kale before I freeze it? Hi Cici! While blanching is not required for freezing, it helps with longer term storage! Hi there. I’m drinking this right now! For me it is a straight liquid, not thick like your picture. There are also little chunky kale bits all throughout that are grossing me out a bit. I only have a ninja blender so maybe that’s why? I’m trying to get past it as I really want more energy. Any advice? The flavor is good. I can’t taste the kale other than the chunky bits. Yes, that may be why it didn’t blend together properly. 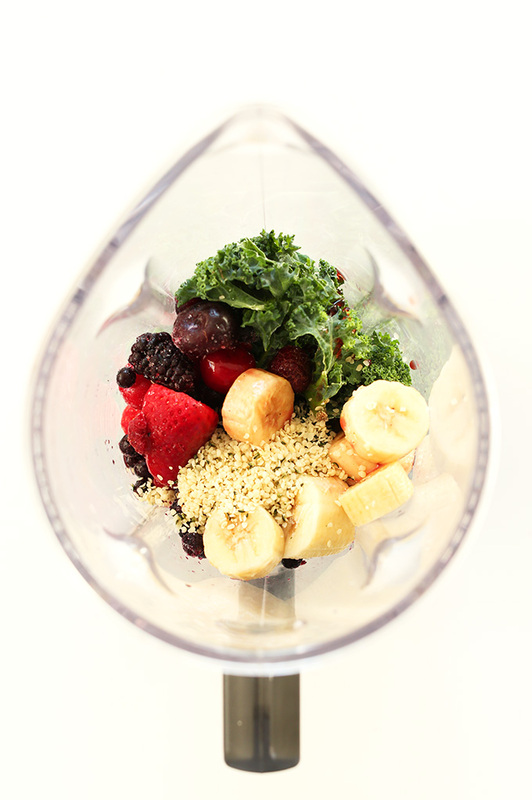 We love this blender and would highly recommend it! Anyone tried to replace the banana with Greek yogurt and add something else for sweetness? I can’t eat banana and it makes it really hard to find good smoothie recipes :( Avocados are out of the question too, both give me a stomach ache. HOLY MOLY!!!!!! eeeeeek! i can’t tell you how excited I am!!! My goal for 2018 is to get more greens each day. Especially Kale. I’ve read so much about the benefits for longevity and disease prevention eating kale. BUT….i can’t stand Kale…always feel like I have to choke it down….and so after 1 ‘meal’ of Kale, i give up :( BUT……this week I’ve tried your Kale Chips (LOVED!) and now this smoothie…..and I am never going back! You’re right……..you. cannot. taste. the. kale. I’m drinking it right now and trying to taste it…..and I can’t. So happy!! I’ve found my vehicle for getting my greens in my body. Thank you so much for this! Ps…i bought the R.W. Knudsen brand of Pomegranate juice. It comes in a glass bottle vs. the others that come in a plastic bottle. My other goal for 2018 is really paying attention to the packaging of my food products and choosing brands with more eco friendly versions. Would using fresh pomegranate arils instead of juice work? Hi Hannah! I’m not sure, and wouldn’t recommend it. But if you give it a try, let us know how it turns out! My wife and I have been making this smoothie for over a year now and it’s great. I feel better within about 10 minutes of finishing one! Only thing is though, here in Australia we’re still waiting for Hemp to become legal to consume (due to become legal by the end of this year). In the meantime, we’ve been using Chia seeds instead, which apparently still contain the 9 essential amino acids – so if you can’t put your hands on hemp seeds but have chia, then I recommend using that instead! I love this smoothie, and would like to reduce the amount of sugar and carbs. If I’ve done my math correctly, it looks like most of those come from the banana. Is that correct, and do you have any suggestions on what to use instead of a banana? Any special prep when freezing greens? Can Spinach and Romaine lettuce be frozen, too? Hi! Nope! Just throw your greens in a freezer bag and you’re good to go! Happy blending! I was so skeptical – I can always taste the kale. Not this time! I’m shocked and very happy :) I’m going to try added unflavored protein powder next time. Delicious! I loved the frozen banana and pomegranate juice. I didn’t have hemp seeds so used flax seeds and added a spoonful of vanilla yogurt for a bit of creaminess. Hi, Was in search for a wicked recipe. Found it, Make it, Smashed it! LOVVED IT! I’ve been having this smoothie every morning for breakfast and I must say it’s absolutely delicious. Thank You! For those of us who live in Australia where eating hemp seeds is illegal, what other seeds do you recommend? I’m confused about the nutrition calculations you have on here. You are saying that each serving has 22g of protein but when I’m calculating it, it really comes out to just less than 5g of protein per serving. Where are you seeing all the extra protein? That’s for the full recipe amounts. What am I missing here?? Sorry for the confusion! It was a typo. I recalculated it just to be sure and it’s now updated! Ahhhh thanks! I was actually hoping I was calculating something wrong so that I was consuming more protein ? Love your blog and use it all the time, you have helped make it easy to follow a plant based diet!! Thank you! Tried this and LOVED it! Was looking for a yummy smoothie recipe that was tasty, but not loaded with sugar. I even added cup of spinach to this and it was still sweet. I also added 1/2 cup of crushed ice. Thanks so much for sharing! This is great. My eye doctor wants me to either eat more kale or take expensive kale supplements. I’m not into organic or detoxing so subbing ingredients doesn’t keep me awake. I use the Ocean Spray diet juices like Cran-Pomegranate or cherry with <1 gram of sugar. Apple instead of banana and it's all good. Thanks so much. This is a fantastic recipe and I use it almost twice a week! :) great source of leafy greens and you don’t even taste them! Wonderful! Thanks for sharing, Angela! Can I make this smoothie ahead of time and refrigerate? The smoothie i mix in a blender. 2 hands of kale leaves. finish mix all in blender about 1 minute serve instantly taste good. I found the avocado thickins & creamy a nice drink & fully filling. Usually you don’t thaw frozen foods for smoothies – if your fruit and such is still frozen when you blend it, the smoothie’s thicker. A lot of smoothies that use fresh ingredients will actually call for ice cubes to help thicken, so frozen fruit is killing two birds with one stone! A hand blender, on the other hand, may not be able to handle frozen foods. So you may have to make do with thawed fruits and thin smoothies until/unless you can get a good regular blender. I have been a huge fan of all of your recipes and I just wanted to let you know that this is the best smoothy I have ever had with kale!! I plan on drinking this every day! Yay! Thanks for sharing, Carly! I have a new smoothie recipe coming out in our cookbook that I think you’ll love. xo! I can sense the the kale is in there, but then again my taste buds have really woken up since I outgrew my allergies! This is the best kale smoothie recipe I’ve had so far. I currently have a batch freezing in popsicle molds. I’ll report back with my kidlet’s opinion! This is a great recipe! I’ve always been a healthy eater, but I’ve been trying to work new veggies into my diet and experiment with smoothies. Embarrassing, but this is really one of my first experiences with kale, and it was a great one. I threw in some plain Greek yogurt to add a bit more protein and to thicken it up a bit. I like to prep for the work week, how long do you think it would stay good in the fridge/freezer? I’ve never taken a liking to healthy smoothies or healthy eating in general. I’m trying to be more healthy for this summer so I made one of these yesterday and I’m surprised at how good it is! I can’t taste the kale at all it’s amazing! I still haven’t tried it with the seeds yet but I definitely will soon. Thank you for sharing a yummy recipe!!! Wonderful! Thanks for sharing, Jerah! Thanks for the great recipes and tips. I found your site while looking for more ways to eat green leafy veggies after reading about the MIND diet. I will never waste another green thanks to you! I just made this and used spinach and orange juice. I did not add any water, but used 1 full cup of OJ instead of 2/3. I have been looking for a way to get spinach down daily because other than salads, I really don’t like it. This will be a good addition to my daily routine. I’m really happy I tried it! Greens are not my thing , so I’m going to have to work my nerve up before I try kale. Hello! Thanks for recipes! i want to use Kale smoothie for weight loss. Thank you for this delicious and easy to prepare smoothie. I used Navitas naturals organic pomegranate powder (2tbsp)- from Amazon or target. Been looking for a way to incorporate this powder into my smoothies and you solved my issue. Thank you! I also added 4 tbsp of Great Lakes collagen hydrolysate- which is cold water soluble and doesn’t effect the taste- has helped my joint pain and smoothed my wrinkles. Enjoy and thanks again! Forgot to mention I used zico pure coconut water instead of plain water. I’m drinking my smoothie right now. It is delcious! Thanks for the recipe! Perfect recipe for a Kale beginner!! The taste is amazing!! Thank you!! Hi. New to all this.. I love this smoothie, am I OK to drink one of theses everyday?.. Not going to overload on anything?.. Many thanks. You certainly can! I do. Just rotate your greens to include a mix of kale, spinach, parsley, etc., to keep your body guessing! would you use a full 2 cups of parsley? or would you just 1/2 spinach or kale and 1/2 parsley? Thanks for completely making that taste of Kale disappear from my smoothie!! I was never a fan of kale or the taste of pomegranate. Now I WANT to make this smoothie every single morning! I don’t have the time or patience to make breakfast so this ends up being a fantastically easy solution (that’s delicious and healthy too)! I love the sound of this smoothie. I just made this green kale smoothie and it was delicious. I will absolutely add this kale smoothie to my morning list of recipes. I have a food sensitivity to bananas. Any suggestions for substitution? Hi Dana, I don’t see Hide Your Kale Smoothie listed under your All Beverages Recipes. I make your smoothies all the time and can you please put that one in there for easy reference…unless it’s there all ready and I somehow missed it (highly likely). I discovered the kale smoothie when I looked at your choc chip pancakes and down below they showed some pictures of recipes I might want to try and tra-lah!, there it was. Thanks! Must’ve missed it. Will do! This smoothie is seriously amazing. I am so, so glad I found it, and so glad you made it! I make it for my mom because she is trying to diet; but I always drink half of it before I give it to her, haha! I’d say that even though it doesn’t taste like it has kale, it does have a texture like it does have kale; but I’m sure that’s probably because I have a bad blender. Thanks for the recipe! haha, nice! Glad you and your mom enjoyed it. Yummy! Even my 3 year old daughter (who hates everything) is lovin’ it! We know how nutritiously wonderful kale is for us but it’s hard to consume a lot of it without going insane! We are juicing and smoothy-ing until we don’t feel guilty about our vacation food binge! We won’t talk about that! What’s on vacation, stays on vacation! Except the fat rolls I brought home with me! Ha! Thanks! As much as I love green smoothies, a change of colour is GREAT! Looks delicious! Ahahahah. I love the reference ‘hide ya kale’ ;) Clever lady! ha! Someone got it. I almost linked to the video in the post. Certainly one of the best you tube moments of all time. Frozen kale! Such a good idea – I always struggle with keeping ingredients fresh throughout the week for smoothies – great to know. I love green smoothies, it’s never occurred to me to freeze the kale before to keep it from turning. I will be using that tip! Yay! So glad you guys enjoyed this. 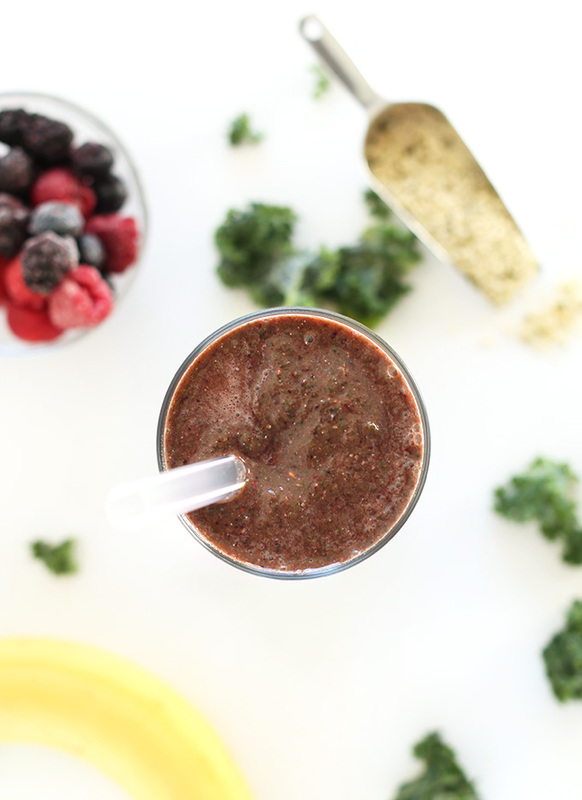 I think the banana + pomegranate juice creates the perfect sweet, berry creaminess to mask all that kale. Cheers! hmm i have pom juice in my fridge right now…PERFECT! Do it! And happy mommyhood, friend! Hope you’re having a blast! Wish that I had read this before going to Costco today, I would have bought Hemp Seeds. I did get Chia Seeds and Pomegranite Juice. Tart Cherry Juice at Trader Joe’s. Now I hav to get Kale, I didn’t know that you could freeze that too! Thanks for your Smoothies recipes. This smoothie looks awesome. I love that color! And all the different vibrant glorious fruits going into this. Awesome stuff. I have never had a kale smoothie before, but I’m totally going to put an end to that very soon! That’s awesome! I never thought of freezing my kale! No more yellow kale for me!! I can’t wait to try this. Where would I look for hemp seeds? I’ve never tried them before. Most health food stores have them, as well as healthy/organic sections in grocery stores. Otherwise, order them off of Amazon! Instead of the pomegranate juice, do you have any recommendation for what whole fruit would work well? I want to keep the smoothie raw, and the only juice that I have access to is pasteurized. I’d say any dark berry would work best! This sounds delicious! And love that you tossed hemp seeds in there too! I’m allll for hidin’ yo kale, just like this! Sounds great, a little high in sugar but it’s too bad. Do you do anything to prep the kale? I’ve been buying bagged organic spinach and kale lately and I just throw the whole bag in the freezer. But if you buy it as is, just rinse, dry, put in a freezer safe bag or container and put in the freezer! What do you mean buying spinach & kale as is? Buying spinach & kale “as is” makes no sense. Please explain. I love using hemp seeds. Great recipe! In fact, I might just have to make myself a green smoothie this morning — thanks for the inspiration. How do you go about freezing your fresh greens? I’m going to be stocking up today but I hate slimy spinach. 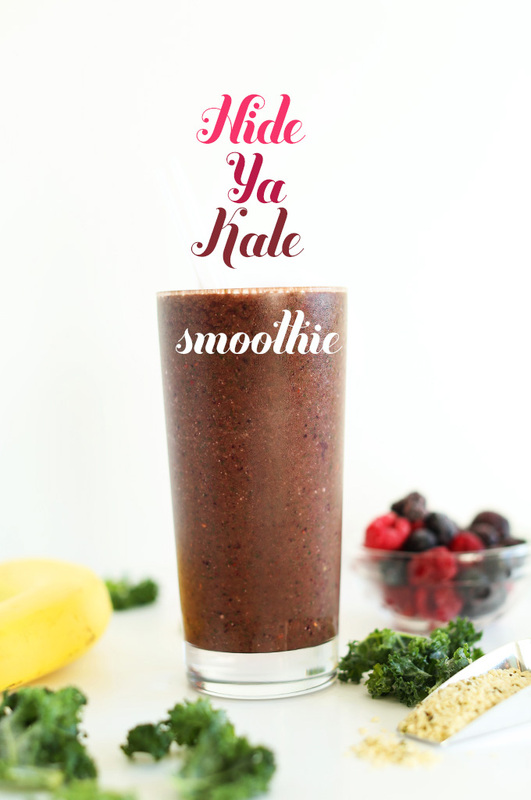 I’m definitely going to give kale a try, this smoothie looks super creamy! You can Pre-blend the spinach with coconut water and a dash of lemon juice first. The put into an ice cube tray or popsicle molds. I’ve used the popsicle route because it’s easy and you get the right amount! Sweet! I was just thinking that I need to start freezing my produce since I never get through it fast enough when I keep it in the fridge. I make my vegetables in the juicer, or in smoothie form, and then freeze them in individual servings. It’s been working out great, and tastes great too! Do you think freezing makes the nutrients go away? costco and bjs routinely sell frozen bags of kale (sometimes mixed w/spinach). one less step! They’ll love it! Let me know how it goes, Maryea! Is it ok to use chia/flax seed blend instead of hemp seeds? Cranberries worked well to disguise kale. Also used grape juice instead of pomegranate.